You are looking at National’s reliever Tyler Clippard’s 2010 numbers. If there is anything surprising, it should only be the fact that he’s been able to record 3 wins in only 14.2 innings. Clippard’s career thus far has been pretty stellar. I was looking through his stats to find some reason why the Yankees would have basically given him away to the Nats in late 2007, but all I could find was impressive ERAs and strikeout statistics. As I looked closer, I liked what I saw even more. After being drafted in 2003 in the 9th round by the Yankees, Clippard averaged 7.5 hits, 2 walks, and 10 strikeouts per 9 innings for Yankees’ farm teams from 2003-2006. While playing for the Trenton Thunder in 2006, Clippard threw the franchise’s first no-hitter. Yes, a no-hitter. Apparently that caught someone’s attention and Clipp was brought up for an emergency start against the Mets in 2007, giving up only 1 R on 3 H in 6 IP. He even recorded his first major league hit in his debut. Then, for reasons I can only explain as a stocked Yankee roster, Clippard was traded to the Nationals in December 2007 for ……let’s see here….someone no one has ever heard of and someone I don’t remember. (It was relief pitcher Jonathan Albaladejo). The Nats converted Clippard to a relief pitcher in 2009 and optioned him to AAA Syracuse. 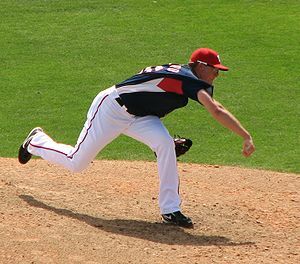 He appeared in 20 games and posted an outstanding 0.92 ERA and 42 strikeouts in 39 innings finishing with a 4-1 record before being called up to the Nats on June 21, 2009. Over the 2009 season, he held up a strong 2.69 ERA through 60 1/3 innings, with 67 strikeouts. Clippard has quickly emerged as a fan favorite this season. It could be the rec specs he wears, or it could be his obvious intensity on the mound and dominating performance. Clippard’s facial expressions show a clear concentration and sheer determination to get the better of every single hitter he faces. At some moments during his outings I have to question how he ever had the energy to keep up that level of intensity through 9 innings as a starter. Lucky for us, Clipp has found his niche as a relief pitcher and only has to harness this beastly energy for 2-3 innings of pure firepower. His out-of-the-ordinary, herky-jerky motion distracts hitters and they are unable to see the spin of the ball as it comes out of his long right arm. He consistently hits low to mid 90s and has a pretty nasty curve, changeup and slider. Hitters must also notice Clippard’s excellent pitch utilization. He’s not out there to get a suntan. Clipp wastes no time and likes to take lineups down 1-2-3. The fans love when he walks off the mound pumping his fists in celebration and mouthing some celebratory words to himself. It’s nice to see this kind of player in a National’s uniform. MASN’s Ben Goessling also says Clippard is a funny guy, well-liked in the clubhouse. Even better.